So a while back before “winter” started, we had a big electrical storm. Luckily I have a Cutler-Hammer whole-house surge protector installed. It took the majority of the huge electrical surge we had, but some other devices in the house (and garage) also got damaged. I’d hate to wonder what would have happened if that surge protector wasn’t present in the main breaker panel. Anyway, the huge surge literally blew up the Cutler-Hammer protector. I could take advantage of their warranty and pay some money to ship the thing to them, wait like 3 months, and then hope that they’d actually replace it like their warranty states. Or….after looking inside (the top was blown off, so why not), copy theirs and make it better and have a surge protector back in the breaker panel way before the 3 months of waiting for the stupid warranty. If you haven’t figured it out by now, yes, I made my own, and the design is freely available so you can make your own! The original surge protector that I bought was a Cutler-Hammer CHSPMICRO. It’s around $50 at Home Depot. It can take 120,000 amps (should be enough to power a flux capacitor), or 1920 joules. Cutler-Hammer has better surge protectors out there, but you have to get them someplace besides Home Depot/Lowes. The surge amps/joules mean next to nothing as you’ll have no idea what kind of surge you’re going to encounter, but the higher the numbers are, the more surges you can handle before something blows up. These surge protectors (or more notably, the Metal Oxide Varistors or MOV, inside) do wear out with the surges that they endure. Eventually they will fail when they endure enough surges. I think they usually fail gracefully in the sense that you won’t know they’re dead. But if they endure a huge surge, they could fail catastrophically, like mine did. In fact, the other devices that were damaged all had their small MOV’s blown up along with vaporized traces on the PCB. This is partly why it’s recommended to change out your small surge protectors from time to time. The other reason is to make you buy stuff that you probably don’t need. Now the whole house surge protector isn’t meant to replace your smaller surge strips and such. They’re a supplement to those, and as an added benefit, you get surge protection for your appliances too. The surge protector that I got from Cutler-Hammer (CH from now on) is designed to protect a normal US 220/230/240V single-phase panel. This probably could be adapted for European power, but I haven’t tried such things. The CH protector is very simple. It has MOVs going between each hot and neutral and then each hot and ground. It also has 4 thermal fuses (2 for each hot-neutral and hot-ground connection) w/ some LEDs so if these fuses blow out, the LEDs go out, implying that your protector is damaged and should be replaced. In my case, the thermal fuses were still mostly intact, even though some of the MOVs inside the box blew up and fire spewed out of one of them. So I guess if the top of your protector blows up and everything is charred inside, that means it’s damaged. For my protector, I beefed up the number of MOVs inside the thing, used higher surge-rated devices, and added 2 additional LEDs so you know if any of the fuses blew. The CH protector only lets you know if 2 of the 4 fuses blew. Other than that, the surge protector is the same kinda design. Attention was given to trace clearance due to the high-voltage, and as much copper as possible was used to get current to the MOVs. What you really want is equal resistance paths to each MOV in order to totally share the load, but this is really hard to do by hand, and hey, I did a better job @ that then CH did. My surge protector is somewhere between the CH CHSPMAX and CHSPULTRA. I dunno how they figure their specs out, so it’s hard to compare joule ratings of the devices I used vs. the ones they used. You’re also free to substitute better MOVs in for an even more awesome surge protector. The ones you sub in need to be rated for 130V (the devices only see 1/2 of the 220V since they’re connected from hot to neutral or hot to ground) and rated for whatever number of joules you want. For wires to the thing, 12AWG stranded is the smallest wire you should use. The holes barely accommodate 10AWG stranded, but you can get them in there. You want as thick of wire as possible going to this. Inside your breaker panel, you’ll need a 15A double-pole breaker (common trip) to connect the two hot wires from the surge protector. The neutral wire in the protector goes to the neutral bus bar, and the ground wire to the ground bus bar. You will need a beefy soldering iron to solder in all the parts. Be careful with the thermal fuses as excessive heat could melt them. I’m not going to offer this as a kit (unless there a lot of interest in such a thing) as there are so few parts that it’s easy enough to go to Digikey or Mouser and order what you need and go from there. One last thing: This isn’t UL/CSA/EU or whatever certified for safety. Use this at your own risk. That being said, I think my design is better than CH’s is, but I don’t have lightning bolts laying around to test this with, so I can’t say for sure. I’m not responsible for any damage that is caused by this device (although w/ the fuses and circuit breaker, you’re pretty safe from any major failure w/ this box). 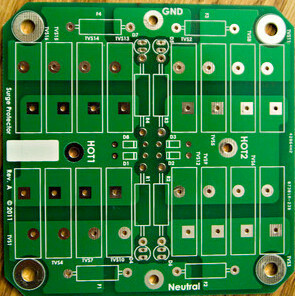 PCBs are $15 shipped to USA only. The Whole-House Surge Protector is copyrighted under the Creative Commons Attribution 3.0 license. If you use these sources for creating your own module that you post online, please attribute my module as the original source (as the license states). Whole House Surge Protector by Andrew Honecker is licensed under a Creative Commons Attribution 3.0 Unported License. Yes they are still available. Looks like you got the cart thing working =). Paypal might have been doing something weird as those boards aren’t real hot sellers. I have more of them if you ever decide to make more surge protectors. Im from Sri Lanka. In here we also face fairly high lightning hits. here we have 230V single phase supply to homes. Im also made such surge protector my self. its L-N, L-E, N-E type protection where L =Live(hot1) N=Neutral E=Earth. I used 20D471 MOVs (20mm, 470V) 6 parallel mov for each rail. but I never installed the thermal fuses. what temperature fuses I need to add? one fuse for each rail (1 fuse for 6 movs) enough ? currently I wired protector through a 10A breaker. Hi, I’m not really sure the thermal fuses really should be in the design (Cutler Hammer had them so I put them in too) as the surge suppressor is supposed to be a sacrificial device. However, the thermal fuses may be there to prevent/reduce the likelihood of a fire from the MOVs blowing up. I don’t think the temperature super important, (should be able to pass > 10A through them) but you don’t want them tripping accidentally either. I’d probably get fuses rated at around 150C-175C. i was thinking plugging it into the surge protector but everyone says the brick is a surge protector. i just want my 360 to last as long as possible any advice on that would be great. I’m not sure exactly what you’re asking, but this isn’t a plug-in-the-wall kind of surge protector. This surge protector would be overkill for a small load like a Xbox 360. You’d be better off getting a decent surge strip from APC or the like. I live in Peru, South America, where a grounded electrical system is almost impossible to find. I recently built a house here and had to have all of my electrical cable shipped in from the States because the folks here couldn’t supply a 2-wire with ground cable. I recently had to replace some expensive equipment because of a surge hit. I just read the article about the Whole House Surge Protector you designed and have a few questions for you. A normal home like you have in the States, here requires a 3-phase power installation just to get enough current. What would be involved in a design to protect a 220/380 VAC 3-Phase (WYE) System? I’m definitely not an expert in surge protection and whatnot =). The surge protector that I made is really just a copy of one from Cutler-Hammer/Eaton, but I was able to improve upon it. Anyway, the way I’ve seen protection done on 120V single-phase here in the US is to have a MOV between hot and neutral, MOV between hot and GND, and a MOV between neutral and GND, which essentially eats up any surges along any of the lines. I’d assume that would still be true for 220V single phase (essentially a MOV across all combinations of wires), but upon copying the Eaton/Cutler-Hammer surge protector, this isn’t the case. Their design (and mine as well) puts MOVs from both hots to neutral, and MOVs between both hots and GND, for a total of 4 sets of MOVs. I’m not sure if it was done this way for cost, since attaching the MOVs in that sense allows me/them to use MOVs rated for 120V operation, not 220V operation (since going from one hot to neutral or GND results in 120VAC), and not doing other wire combinations also results in less devices being used. For your three-phase system, I’m guessing you have at least a 3-wire system, but more likely have 4 or 5 wires coming in. I would assume 3-phase surge suppressors would be designed in a similar manner as single-phase, where I’d imagine every 2-connection combination would have a MOV between it. For example, a MOV between HOT1 and HOT2, MOV between HOT2 and HOT3, and a MOV between HOT1 and HOT3, and likewise more combinations if you have neutral and GND wires coming in too. And also in your case, you’d probably need higher voltage rated MOVs, which also costs more per part. Honestly, since you’re already ordering stuff from the states, it would probably be best to order a 3-phase surge protector than trying to design one yourself, as the high voltage, high surge capacity MOVs aren’t cheap and probably not all that readily available either.